During the 2018 regular legislative session, West Virginia Department of Health and Human Resources (WVDHHR) Cabinet Secretary Bill Crouch told legislators that our state was experiencing a “child welfare crisis.” The agency reports this year that emergency has only continued to grow. The Centers for Disease Control and Prevention anticipate the opioid crisis alone will claim 1 million lives nation-wide by 2020 if no corrective action is taken, which is to say nothing of the havoc that would wreak on the quality of life for families and kids. But professionals in the state passionate about child welfare are determined to change the trajectory. According to the state DHHR, West Virginia is the number one state in the country for children removed from their homes, and around 85 percent of these Child Protective Services (CPS) cases involved drugs. As of September 2018, almost 7,000 West Virginia children are in foster care. DHR estimate that to take proper care of our kids we need more social workers, psychiatrists, health care facilities that could cost more than 150 million dollars. “There just aren’t enough people out there. We’re overwhelmed. The whole opioid epidemic, the need for foster placements, has just spiraled,” Amanda McCreary said. A social service coordinator at the WV DHHR in Wheeling, she’s among the state employees on the front lines of the foster crisis in the Northern Panhandle. McCreary explained that her agency has seen a 34 percent increase in Child Protective Services cases, but staff to handle those cases has not matched that increase. She said the complicated needs of children makes placing them especially difficult. “It is a huge complex issue that is going to require a lot of money that West Virginia as a state probably doesn't have,” she said. Foster parents today are desperately needed, but with such a strained state system, parents have to be prepared. David Johnston is a United Methodist pastor. He and his wife are foster parents in southern West Virginia. He says kids are coming into the system with a lot of trauma. Johnston went on to explain that in addition to normal routine parenting responsibilities like doctor visits and extracurricular activities, foster parents have to tend to additional meetings like court hearings and visits with biological parents, as well as special mediacal needs to deal with behavioral issues they’ve often developed. Johnston said foster parents today need extra support from communities and workplace flexibility in order to properly be present for their charges. Experts across disciplines -- health care, schools, courts -- have all observed the landscape of their workplaces change drastically in the last 20 years. People throughout the region who work with children all report observing increases of children coping with traumatizing experiences. Watt was at a roundtable series focused on the state’s child welfare crisis this fall. Watt spoke about the “new normal” she’s experiencing at her elementary school where children are routinely recounting violent acts at home as if they are ordinary occurrences. 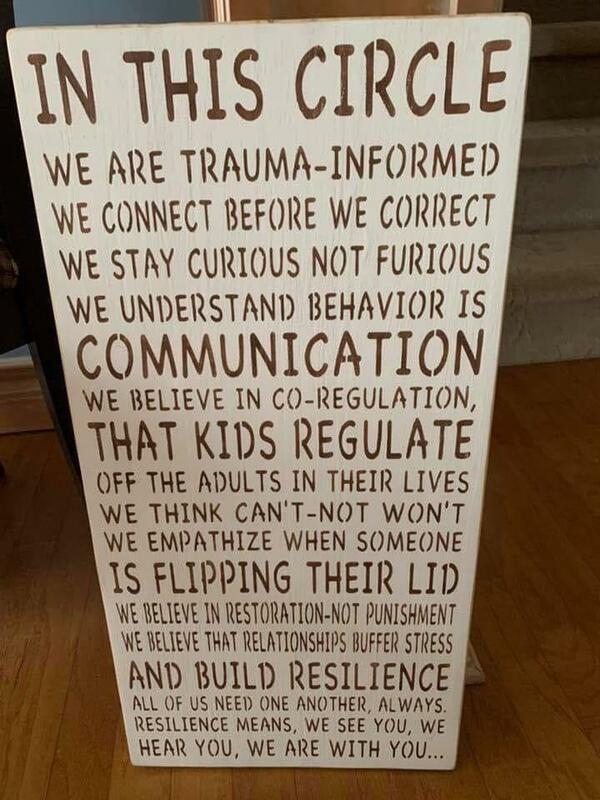 Madison Elementary has since embraced trauma-informed practices where teachers and staff have all learned to recognize and respond to traumatized children, and all school employees work together to provide a consistent, safe, and compassionate environment. Health care practitioners and mental health experts in the state are calling for not just schools, but hospitals, workplaces, recreational spaces, and all institutions in the state to become trauma-informed. Anyone interested in foster care and adoption opportunities can learn more though the WV DHHR or contact Mission WV at 866-CALL-MWV.